Barges wait for traffic to re-open along the Mississippi River near Vicksburg, Miss. on Monday. VICKSBURG, Miss. -- With more than 50 vessels idled on the water for a fourth day Wednesday, authorities said they still did not know when they would be able to reopen a 16-mile stretch of the Mississippi River that was closed due to an oil spill. A plan to pump oil from a leaking barge onto another barge — a process known as lightering — had been approved, but it was unclear how long that would take, Coast Guard Petty Officer 3rd Class Jonathan Lally said Tuesday. He said the other barge was en route. Severe weather that was expected to sweep through the area could shut down cleanup operations for a time, prolonging the process further, authorities said. Crews have been working around the clock to contain and remove oil since the barge, owned by Corpus Christi, Texas-based Third Coast Towing LLC, struck a railroad bridge and began leaking early Sunday. The company has refused to comment on the incident. Lally also noted that about 7,000 gallons of crude oil were unaccounted for aboard the barge. He said it was not clear whether all of it spilled into the river or some seeped into empty spaces inside the barge. 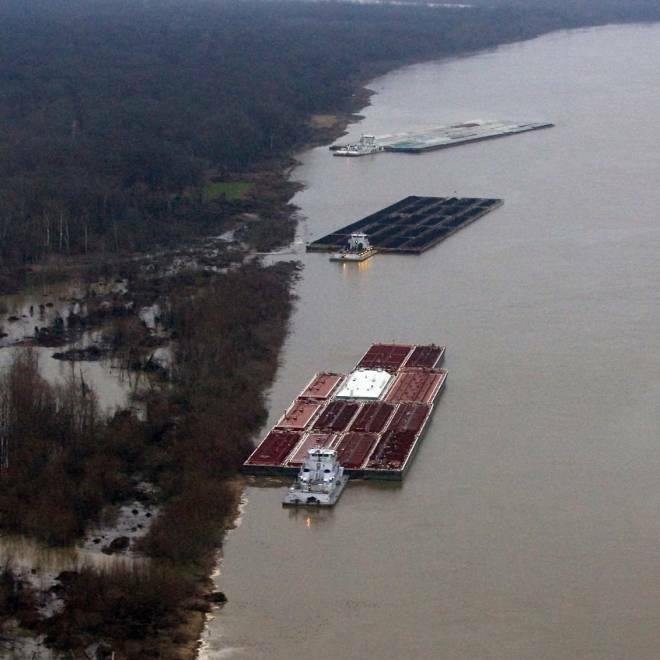 At least 54 vessels, including towboats and barges, were idled on the river, one of the nation's vital commerce routes. More than 168 million tons of cargo a year moves along the Mississippi between Baton Rouge, La., and the mouth of the Ohio River, carried by nearly 22,300 cargo ships and 162,700 barges, according to the Army Corps of Engineers. About 3.6 million tons of cargo is handled annually by the port of Vicksburg. When low water threatened to close the river earlier in January, the tow industry trade group American Waterways Operators estimated that 7.2 million tons of commodities worth $2.8 billion might be sidelined over the last three weeks of the month. Salt destined for Northern roads moves upriver in January, said spokeswoman Ann McCulloch. "We're still moving corn, soybeans and grain, but also coal and petroleum ... stone, sand and gravel," she said Tuesday. Barges carry 20 percent of the nation's coal and more than 60 percent of its grain exports, according to the group. Ron Zornes, director of corporate operations for Canal Barge Co. of New Orleans, said each idled towboat could cost a company anywhere from $10,000 to $100,000 a day. The low end would be for a single boat with a couple of barges and the high end for one in "a system of towboats that acts sort of like a bus system." "So if one bus is stopped it gums up the whole system," he said.